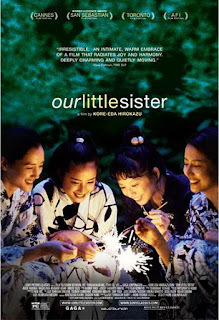 The Japanese film OUR LITTLE SISTER is based on Umimachi Diary (“Seaside Town Diary”), a Josei manga series by Akimi Yoshida. (Josei manga means “comics for women,” and is aimed at older teenage girls and young women.) The highly regarded director Hirozaku Koreeda adapted the series, transforming Yoshida’s serial and its painterly art into a lovely live-action drama. The story centers on the three Kouda sisters, 29-year-old Sachi (Haruka Ayase), 22-year-old Yoshino (Masami Nagasawa) and 19-year-old Chika (Kaho). They live together in Kamakura, a seaside resort town just south of Tokyo, in a house owned by their grandmother. Their father left the family for another woman years ago, and their mother left not long afterward. The sisters, who haven’t seen their father in 15 years, receive news of his death. They travel, reluctantly, to attend his funeral and meet their 14-year-old half-sister, Suzu Asano (Suzu Hirose), their father’s daughter by another wife. Suzu’s mother is dead, and her stepmother, Mr. Kouda’s widow Yoko, has little connection with the girl. The sisters invite Suzu, who’s exceptionally sweet-looking in her sailor dress and socks, to come live with them. Suzu enjoys living with her new sisters in a house she describes as “like a girls’ dormitory,” filled with sisterly affection, shared clothing and gentle teasing. Suzu is fascinated by the family’s traditions of making plum wine and praying at a home altar to their ancestors. She readily adapts to her new school and joins its soccer team. Soon tensions arise because, as the Kouda sisters’ great aunt points out, it was Suzu’s late mother who “destroyed the family.” Suzu misses her father, who used to take her fishing, and bears the weight of things not her fault. “Someone is always hurt just because I exist,” she laments. The girls’ individual stories are artfully woven into the film’s tapestry. Sachi, a hospital nurse and the unofficial “mother” of the family, deals with a relationship with a married pediatrician; the specter of her father’s serial adultery haunts her. Chika juggles many unsuitable boyfriends, and good-natured Chika works at a sporting-goods store. The girls’ estranged mother shows up for a visit tinged with regret and recrimination. This is a quiet film that is unlikely to appeal to those expecting lots of action. It has a calm, Zen quality, with aesthetically composed frames and an emphasis on nature (the blooming of cherry blossoms) and life cycles (Sachi begins working in a terminal care ward and helps a family friend die peacefully). The Koudas family’s fractured family dynamics are belied by the serenity of the setting, which signifies the love, compassion and understanding that bind the young women. (In Japanese with English subtitles.) 3 1/2 out of 4 stars.